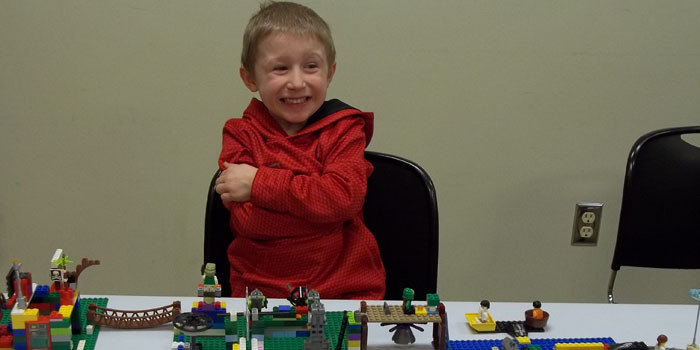 Riker Larson shows his delight with his Lego creations at North Webster Library’s Lego Club. The next meeting is at 1 p.m. Saturday, March 10. A child is never too young to start them on the path of learning. At North Webster Community Public Library’s Lapsit Story Time, parents and their babies and toddlers have fun learning together. Exploring books with brief stories; singing simple songs with hand motions; and having fun playing with scarves, shakers, bells, and bubbles are part of each session. For ages birth to 36 months, Lapsit Story Time is held at 11 a.m. every Tuesday and Friday through April 27. It also gives parents an opportunity to socialize and network with each other. To sign up for Lapsit Story Time, contact the Youth Services Department. Genealogists will have an opportunity to network at the library’s All Day Genealogy session Tuesday, March 6. Genealogists are encouraged to bring their laptops and share their website subscriptions and other resources with fellow genealogists. Sharing resources and research ideas may help you uncover new information to add to your family history. The library’s computers and free website subscriptions will also be available along with its collection of historic records, family and local histories, and how-to books. The doors open at 10 a.m. Drop in for a while or stay the whole day. Looking for a way to relax and unwind? Try meditative drumming. Ladies Drum Circle meets at 6 p.m. on the first Wednesday each month and will be accepting new members at its March 7 session. Instructor Pirkko Miller guides the group in drumming techniques and how to achieve the therapeutic benefits of a calming, peaceful state of mind. Ladies Drum Circle is free, but pre-registration is required. Sign up at the Circulation Desk or call (574) 834-7122. Registrations are currently being accepted for John Miretti’s Stained Glass Workshop at 1 p.m. on Wednesday, March 21. An accomplished stained glass artist, he will instruct participants in creating their own 6×8 inch stained glass art piece. Cost of the workshop is $10 and includes all supplies. Pre-registration is required with payment due when registering. Since enrollment is very limited, another workshop will be offered April 9 and available for sign up as well. At 10 a.m. on April 12, bestselling author Beverly Lewis will be here in person for book signing and discussion of her latest book The Road Home. Copies of the book will be available for purchase with her personally signing each book purchased. Born in Lancaster, Pennsylvania, Lewis is a prolific writer of Amish fiction and has authored over 80 books throughout her career. Free reserved seating tickets for the event are available at the Circulation Desk or call (574) 834-7122 to reserve a seat.